Junior/Senior League A competitive and instructional program for 13-16 year old players on a 90 foot diamond. Intermediate A competitive and instructional program for 12-13 year old players on a 70 foot diamond. Majors A competitive program for 12 year olds and stronger 11 and 10 year old players on a 60 foot diamond. AAA A competitive and instructional program for 11, 10 and stronger 9 year old players on a 60 foot diamond. AA A competitive and instructional program for 10 and 9 year old players on a 60 foot diamond. First Grade An instructional program with tee ball and coach pitch intended for 1st grade players. Kindergarten An instructional program with tee ball for Kindergarten players. See the specific league page for more details. 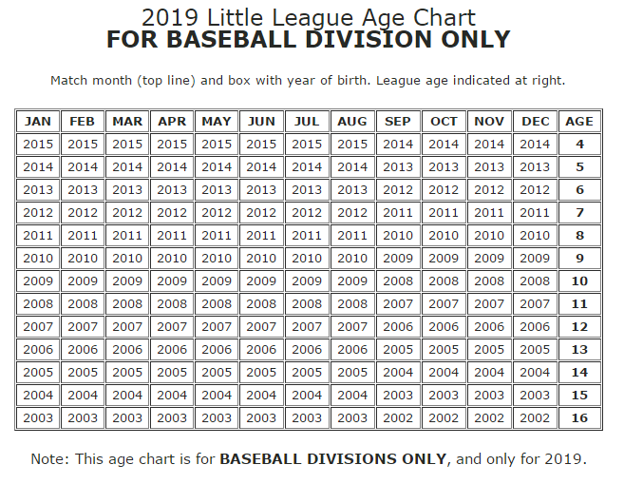 Eligibility for tryouts is based on LL Age or "Little League Age" Use the Chart below to determine your Little League Player’s Age. 12 year olds –Tryout required for all Non-returning Majors players, All 12 year olds must register by Sept 27, 2018 even returning major players. ****New for Spring 2019**** 12 year olds – Intermediate 50/70 Program for 12-13 year olds. Tryouts required for 12 year olds only. Register by Sept 27, 2018. In the event of inclement weather, alternate tryout dates will be announced; however, every attempt will be made to hold tryouts as scheduled below. Players who are trying out for Majors do not need to tryout for AAA. However, you can attend both tryouts if you want to. All 11 year old players are required to tryout (even returning AAA players). We do this so that we may properly balance the teams. If you cannot make your tryout time slot you may show up at any time during the tryouts. We use the schedule above to alleviate long lines. If you cannot make the Saturday tryout you can attend the Majors Tryout on Sunday September 30th. Just mention when signing up at the tryout that you are here for AAA tryout. If you cannot make either tryout date there will be a supplemental tryout. Email for Date and time. Notes: Players who were in Majors last year do not need to tryout for Majors again this year. All other players are required to tryout (even twelve year olds), so that we can properly balance the teams. If you cannot make your tryout slot you may show up at any time during the tryouts. We use the schedule above to alleviate long lines. If you cannot make the Sunday tryout you can attend the AAA Tryout on Saturday September 29th. Just mention when signing up at the tryout that you are here for a Majors tryout. For questions on Majors or Triple ‘A’ tryouts, please Email . If you cannot make the Sunday tryout you can attend any of the tryout times for majors on the 30th or AAA Tryout on Saturday September 29th. Just mention when signing up at the tryout that you are here for an Intermediate League tryout. If you cannot make either tryout date there will be a supplemental tryout. Email jsolomon@psdfirm.com for Date and time.